The following message was provided on the facebook page of Ian Vanes. It is with regret that I am writing to inform you that as of Monday 13th June 2016 @Futsal Leeds will be closed. As you will be aware @Futsal Ltd went into administration in December 2015, Play Football Ltd were contacted by the administrators and agreed to attempt to take over the three sites and try to make them into a viable business. Despite our best efforts Play Football have been unable to reach an agreement with the Landlord of the Leeds site and it is for this reason that the site will no longer operate. It’s a huge shame. 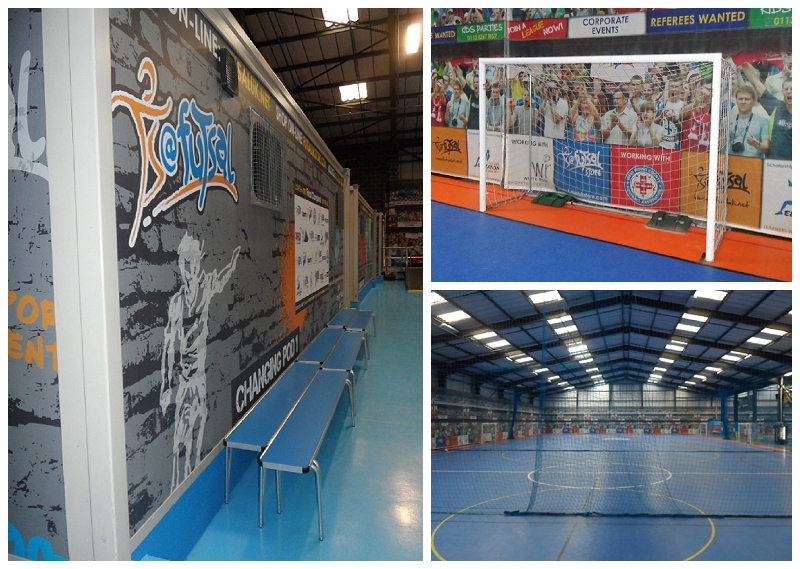 Big futsal facilities like this are few and far between in the UK, and when it opened we all had high hopes that this was going to help the game grow. It’s now up to others to take on the mantle. 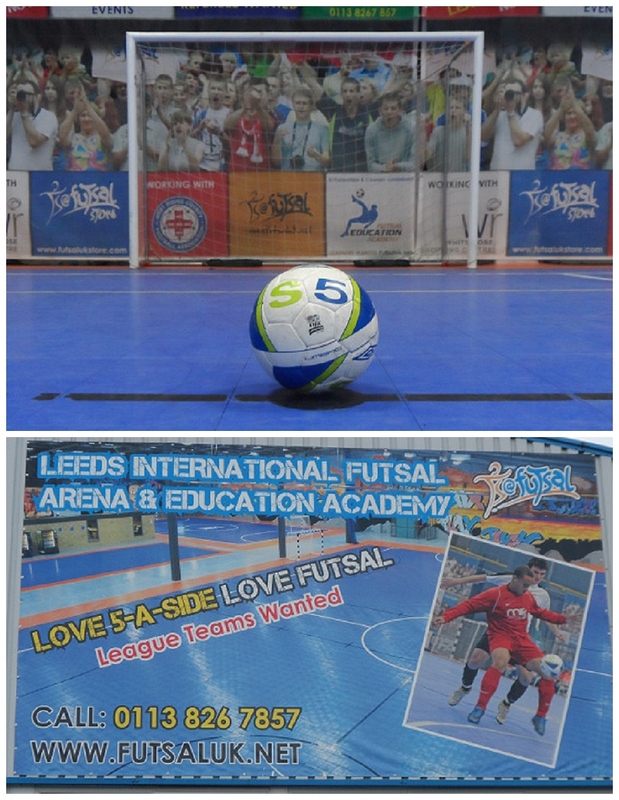 It might now be closed, but it’s still worth remembering Leeds Futsal arena, which brought a fresh approach to what was a little-known game of ‘futsal’ (at least in the UK) when it first opened its doors. In the same way you had Goals Soccer centres and Powerleague driving the regular 5-a-side explosion, a provider calling themselves @ Futsal Limited (why it decided on putting the ‘@’ in the name, we’re still trying to work out) set its self up trying to drive futsal forward. With a guy called Frank Rodriguez (emerging entrepreneur of the year 2005 and ex-manager of Reading FC Ladies) at the helm, they set out on a rapid expansion plan across the UK which began with their first facility, opened in Swindon in 2009. As of 2013 they had 3 arenas (adding Leeds and Birmingham to their Swindon site) and had ambitious plans to open a total of 15 sites in the next 2 to 3 years which would have made them a major player in the UK. As it turned out, however, the growth never materialised and in December 2015 @Futsal went into administration. Sadly the Leeds site couldn’t be saved. 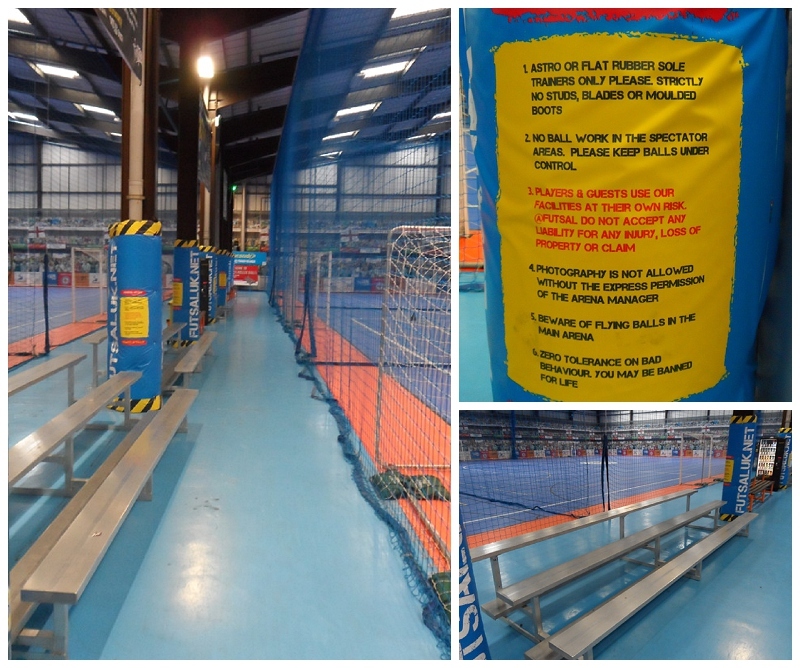 Futsal courts in the UK need to be built indoors and @ Futsal accommodated that with a strategy of building their facilities in existing warehouses which can be transformed into 5-a-side arenas – a lot quicker and easier than building from scratch. 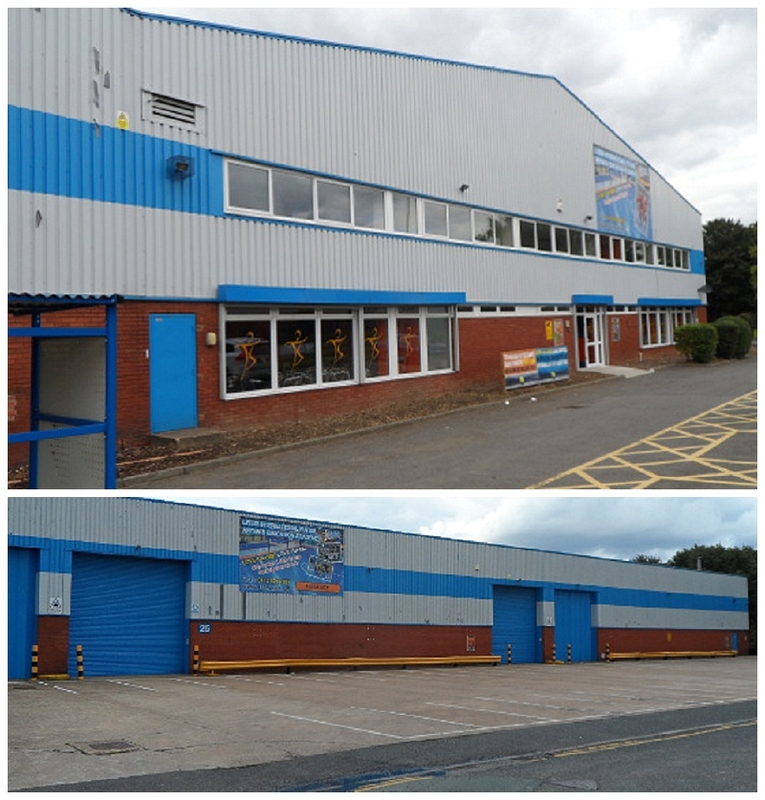 Each one of their 3 facilities was in a warehouse like the one pictured below in Leeds. Housing these facilities inside existing warehouses means that the facilities might not be much to look at from the outside, but it’s really the inside that matters. Walk inside the arenas and you were immediately impressed with the facilities on offer. From the urban graffiti to the electronic scoreboards, the quality flooring, spectator benches, and the great crowd scenes on the wall (we absolutely loved this, but note that not all of the areas have it) – lots of thought went into making this a great playing experience for people coming there. The Leeds arena even had an Xbox in the foyer for people to play on (you know what to do next time you’re subbed). No details in the design were overlooked – like the pitches being named after the famous stadiums of the world (it feels so much better to say we’re playing at the ‘San Siro’ rather than ‘Pitch 4’). The pitches themselves were about the same size as a standard 5-a-side pitch. The obvious difference being that they don’t have barriers round the sides that you can play the ball off. If we had any criticism at all, it would be that there wasn’t perhaps as much room between the netting and the edge of the pitch as we would have liked. There was barely enough room for you to stand behind the ball on some of the sidelines! But it’s not a major grumble; the pitch and the rest of the facilities were reasonably well maintained. A panorama of the pitch! Check out the wall coverings – click to enlarge. How did it compare with other 5-a-side facilities? It compared very well indeed. If you’re were used to playing on Astroturf, you might have experienced some initial yearning for the artificial grass we know and love, but we were surprised that the surface they put down in the Arena was quite pleasant as well (although there were grumbles that it wasn’t swept often enough, so became slipply). It was a far cry from your typical sports centre – not hard wooden flooring which can be rough on the knees, not to mention burning like hell if you’re unfortunate enough to fall over! 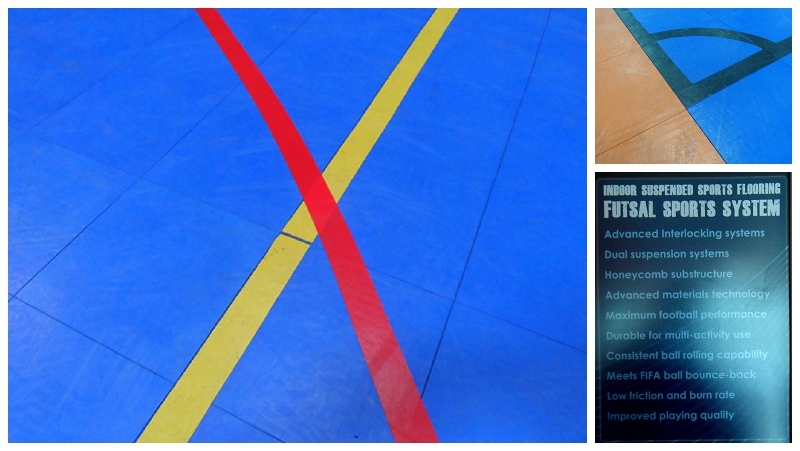 Nope, @ Futsal used a special flooring system of interlocking panels to give maximum grip but minimum burn if you fall. Importantly, with its ‘dual suspension system’ it provides enough give underfoot, reducing the impact and wear and tear on the knees. The key upside of it being indoors was that you’re sheltered from the elements, so there’s no rain lashing down or freezing wind blowing across your face. With all the thought that went in, it was a shame that it never fully took off, and ended up entering administration. 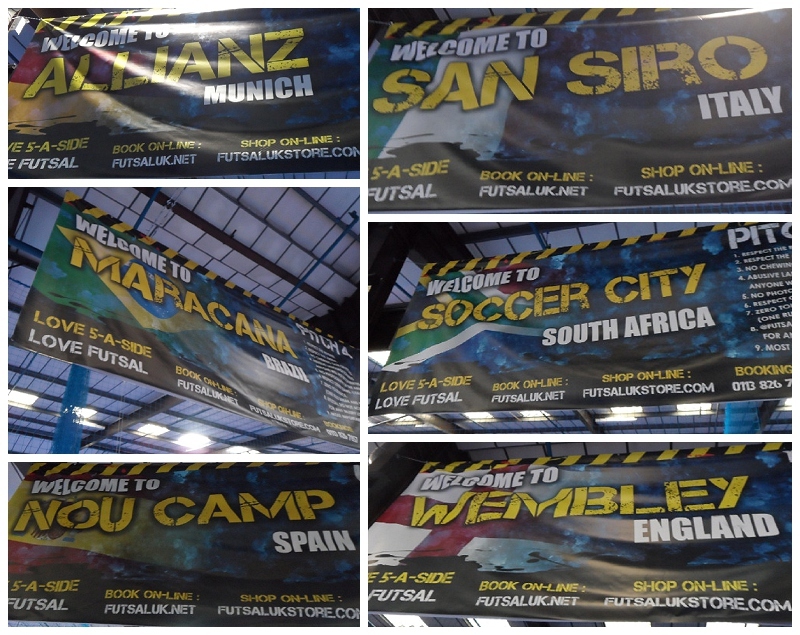 Still, we’re a long way forward with futsal in the UK compared with where it first started. It’s now up to other people to carry these facilities forward. Being a regular player and user of Leeds Futsal Arena, how come only Leeds is closed whereas Birmingham and Swindon aren’t? Landlord issue? Were all three sites run quite differently? The nearest Futsal places are Salford, Manchester or Sheffield which are a long way for my young Futsal Deaf team to try and develop their skills and experience. I am sad and gutted. Hi Paul, I share your disappointment. Obviously I can’t speak on behalf of @Futsal as I have no connection to them, but my guess is that it’s a landlord issue. When they entered administration, they almost certainly owed the landlords of each of the facilities money, and I am sure that the new owners, Playfootball, had a job on their hands to renegotiate each of the leases. It looks like negotiations with the Leeds landlord couldn’t be agreed, whereas the other two sites proved easier. I would guess that the Landlord doesn’t care too much who uses the warehouse, but in the end it looks like Playfootball probably couldn’t agree a lease that matched what the landlord felt they could get from another business. Just speculation on my part – that’s nothing official. It’s a huge, huge shame. Good article – like that you when and checked these places out for yourself. Would love to see something like this up in Edinburgh, given the awful conditions we sometimes end up playing in. I also think that the stadium names are a nice touch – I get off telling people I’m playing at the San Siro at my local World of Soccer! Thanks for the comment. Yeah, if you ever get the chance to visit one then go and do it.! I think something like this could really take off in Edinburgh – got a lot of time for that place and the people. I think Scottish football in general could do with good weather-resistant facilities. Hope your 5s is going well!